The weather has cooled down the last few nights where I live… cold winds ushered in by thunderstorms. It’s made me think that fall will perhaps be here sooner rather than later. But that’s okay. I’ve always enjoyed the autumn breezes and warm browns and oranges that mark the season. It’s not quite cold enough for sweaters yet, but it’s cool enough I’m wanting to start my fall wardrobe, so I picked up a gift that tickled my fancy for that! I stopped by Guilia Design and picked up the Third Life Group gift called “Cherry Gold”. I’m not too sure about the name as the gift includes these great black leather pants plus this gold tones snake skin top and a separate mesh belt, but I’m going with it because I really love the outfit! Cherry Gold comes in all the standard mesh sizes plus quality alpha layers for system bodies (if you need it). Remember, the Third Life group is only 10L to join if you are not already in it, so this gift will only cost you 10L. 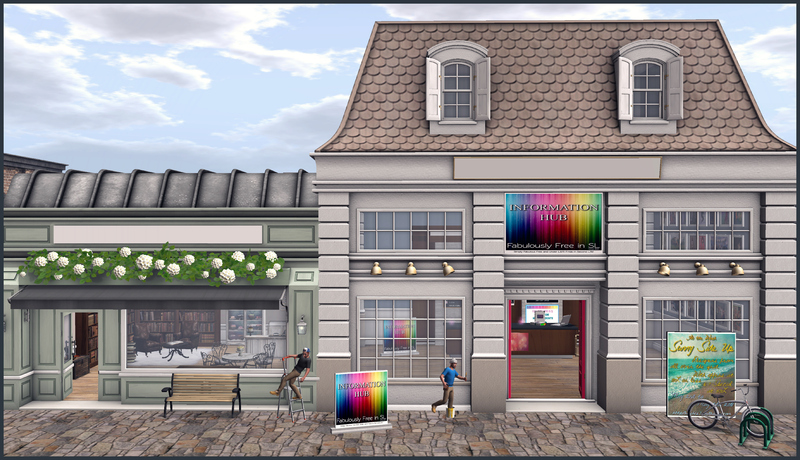 And the Third Life Group gives you access to gifts in stores all over the grid, so it’s well worth joining! I don’t usually show off collar gifts, as they are not my personal style… but I love the quality of clothing and items at Salt & Pepper and I think the creator turns out some truly beautiful gifts. I wanted to make sure and share this new gift that Salt & Pepper has out for group members, as it’s incredibly well made and really lovely. The “Toy” Collar comes in two versions “His Toy” or “Her Toy” and both are fully customizable with a hud that allows you to change the color of both the leather and the metal. (I’ve included a picture of the advertisement below to show the options). It is also resizable making it unisex as well. You’ll need to click the menu to find the resize option. It is RLV enabled for those who are interested. 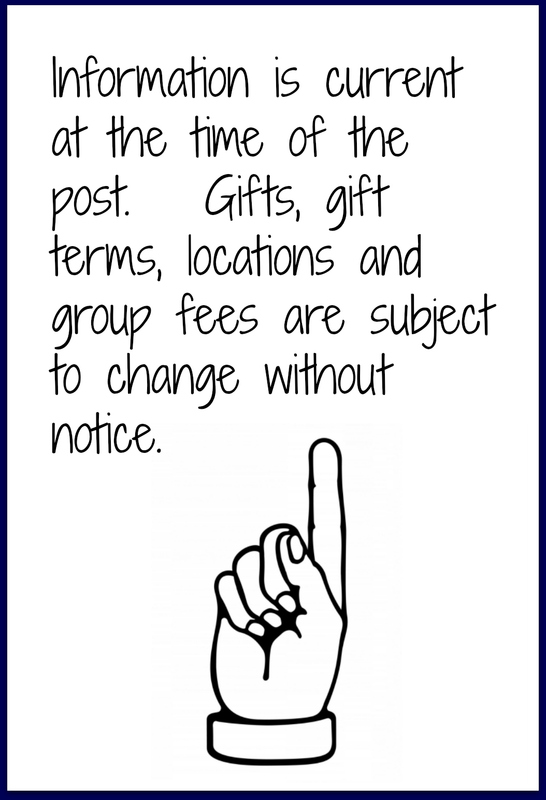 The Salt & Pepper Group does have a one-time join fee of 300L, however there are quite a few very nice past group gifts still out for you to enjoy, and the creator is generous about putting out new, quality group gifts as well, making the fee worth it in my opinion! Categories: accessories, fetish, group gifts, groups, jewelry, mesh, other, pants, shirt, Uncategorized | Tags: 10L, Astrid (Portia Swords), belt, choker, collar, fab free, fabfree, fabulously free in SL, fashion, Fashism, fetish, Fetish Fashion, gift, gifts, Giulia Design, Glam Affair, gor, gorean, group gift, Ikon, JellyRoll, maitreya, Maitreya Lara, MESH, outfit, pants, Salt & Pepper, Second Life, shirt, sl, Tableau Vivant, Third Life Gift | Permalink. 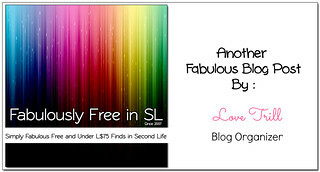 Hello Hello Fab Free’rs! It’s the end of the week and that means a new designer post! This weeks featured designer is none other than Tiar. For those in the Gorean role-play/lifestyle communities in Second Life I would consider Tiar among the top shops for male and female Gorean clothing, as well as some Gorean furniture. That said, Tiar also has a wide range of urban clothing for both men and women as well as contemporary furniture. It’s another one of those shops with something for everyone. I purposefully neglected to do my usual exterior photo for Tiar because there is just so much to see. If you wander through the store on your own, you’ll quickly find the room with new releases, and re delivery terminals. In this area of Tiar there is a daily sales item for just 60 lindens (see the bottom photo above). The Tiar landing point is a center courtyard with 4 corners. One corner has the general information about associated groups and events, along with several sale items. You’ll notice the little footprint style markers along the ground leading to the sales boards, most of which are 25 or 35 lindens. Another corner has a few more sales items, a big raffle board, and a large teleport board that will let you easily navigate Tiar’s many departments. You’ll want to use this teleport board to travel to the Midnight Madness area. Additionally, you’ll find Tiar’s gacha yard sale in this cool little courtyard, along with KittyCats for sale. 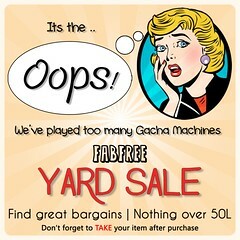 If you collect KittyCats or enjoy hunting through gacha yard sales you won’t want to skip these. Once you’ve used the teleporter in the courtyard at Tiar to go to the “Midnight Madness” area, you’ll find yourself in a small room with lots of group only opportunities for FREE items. 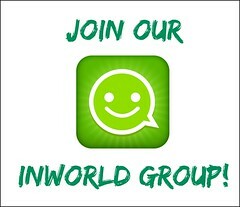 The Tiar group is FREE to join. There are 3 Midnight Madness boards, 8 Lucky Letter Boards, a Sales Board, and 3 camping chairs. The items on the camping chairs and the Lucky boards all rotate so there are tons of items. One thing I noticed right away is most of the Lucky Letter boards seem to be on a short 3 minute rotation, which is really nice. This room is also where you can pick up the exclusive Fab Free group member gifts. There are two gifts at Tiar for the Fab Free group, one mens and one womens. Carson showed the mens gift in his post “Beach Therapy.” As always, the Fab Free group is FREE to join. Just wear your group tag to get the gifts from Tiar. Happy Shopping Fab Free! Categories: camping chair, Contests / Raffles, FabFree Group Gifts, fantasy, fetish, FF Designer Of The Day, Free, furniture, gacha, group gifts, groups, Lucky Board, mens, mesh, midnight mania, other | Tags: Camping Chairs, cheapies, Daily Sales, events, fab free, Fab Free Designer Friday, Fab Free in SL, fabfree, fabfree in sl, fabulously free in SL, fashion freebies, Fashion in SL, FFDF, free, free in sl, freebies, gifts, gor, gorean, Gorean Fashion, Gorean Freebies, Gorean Furniture, group gifts, Lucky Letter Boards, male fashion, midnight madness, Raflle, Role play, RP, Sales, sl free, SL Freebies, tiar, urban, Urban Fashion, Virtual Fashion, women's fashion | Permalink. 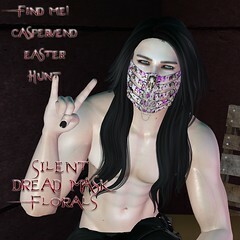 I always feel like it’s pretty special when I can find gifts to put together a free roleplay outfit. Especially one that I feel is top quality. I’ve already shown you some of the great gifts to be had at the Gacha Garden in my posts here and here, but I wanted to make sure that I put together a roleplay look when I discovered that several quality roleplay creators were involved in the event! I’m not sure if I feel like a Nymph or a Dancing Girl in this silk and chains outfit by Broken Style, but I do know it is beautiful. This free gift at the Gacha Garden by the Broken Style gacha machine includes a skirt and top that are separate and come in one Maitreya Lara size. The top includes the mesh arm wraps that move beautifully with your avatar (I didn’t have any clipping issues at all) so they would be perfect for dancing and they worked great with my Animation Override. The detail on the chains and the breast plates is simply stunning. Near the Kite gacha machine I picked up the free gift and it gave me what became the “crowning glory” of my outfit… this flowered crown of roses. Inside the free gift package is three different colored rose crowns: pink, rose (shown), and white. So you’re sure to find a color to match other roleplay outfits as well as this one. It was also easily editable to get it to fit with my head and hair. I just stretched it a bit and adjusted it and voila, it was perfect! Enjoy the gifts at the Gacha Garden and if you decide to wear this out to roleplay, Happy roleplaying! Categories: accessories, appliers, costumes, dress, events, fantasy, fitted mesh, Free, group gifts, groups, mesh, other, skins, tattoo, Uncategorized | Tags: 0L, applier, appliers, Astrid (Portia Swords), Broken Style, Catwa, Catwa Tumble, dress, fab free, fabfree, fabulously free in SL, Fallen Gods, fantasy, fashion, Fashism, flowers, free, free fashion sl, free in sl, free sl, freebie, freebies, freebies sl, gift, gifts, Glam Affair, gor, gorean, group gift, hair flowers, Ikon, KITE, maitreya, Maitreya Lara, Medieval Fantasy, Omega Appliers, Roleplay, rose, roses, RP, Second Life, silks, sl, tattoo, Wasabi Pills | Permalink. I’m stirring up a little magic in my roleplay today, courtesy of SLB 14! I visited the event and was thrilled to see that roleplayers were not left out of the free treats and gifts to be picked up. I was amazed at the generosity of [Tia], the creator of the Grimoire Table you see in my photo above. It is the free gift you can buy for 0L if you visit the [Tia] booth at SLB 14. The table is all decked out with tons of detail, including lit candles and a rotating magical aura on the book on top. For all this detail it weighs in at a mere 5 prim. This is a must add to your inventory for roleplay furniture. My dress is a free gift also. If you go to The White Armory, and head inside the main building, you will see that it also houses BlueMoon Enterprises, where you can pick up their latest free gift (the group is free to join), this Saoise Dress in Aqua. It comes in all the standard mesh sizes and includes a quality alpha so that you’ll be able to fit it to standard or mesh bodies either one. It’s perfect for some magical roleplay! Categories: dress, events, fantasy, formalwear, Free, furniture, group gifts, groups, Home & Garden, mesh, Uncategorized | Tags: 0L, BlueMoon Enterprises, catwa head tumble, dress, elikatira, fab free, fabfree, fabulously free in SL, fantasy, fashion, Fashism, free, free fashion sl, free in sl, free sl, freebie, freebies, freebies sl, gift, gifts, Glam Affair, gor, gorean, gown, grimoire, group gift, Ikon, magic, Magick, maitreya, medieval, Medieval Fantasy, Roleplay, RP, Second Life, sl, SLB14, Tia | Permalink. Good afternoon FabFree Readers! This week I have shown you a few of the free hunt prizes from The Good Gorean Hunt [HERE] and [HERE], and I wanted to show you just one more before I move on to my next hunt project! The gorgeous ruby red, black and gold trimmed Prized Set including the top and skirt as well as the Jaspe layered Medallion Necklace are a free gift for the Good Gorean Hunt at Ladylicious. This mesh set comes in plenty of sizes with co-ordinating alphas if you need them. As previously mentioned, the icon you are looking for is a “G”. Categories: accessories, dress, formalwear, Free, hunts, jewelry, mesh, shirt, skirt | Tags: 0L hunt, Bold & Beauty, Catwa, damselfly, fab free, fabfree, fabulously free in SL, formalwear, free fashion sl, free hunt, free in sl, freebies sl, gorean, Honeycomb, hunt SL, Ikon, Ladylicious, Love Trill, LW Poses, maitreya, Roleplay, Second Life, sl, SL gorean, The good gorean hunt | Permalink. 25L Tuesdays are a dream come true for roleplayers in Second Life… though I think this special item I came across today would please just about anyone. On a Lark has a pretty camisk out that roleplayers may just want to add to their wardrobe… and those of you who wear modern clothes could wear it with a pair of jeans and call it a pretty shirt. This is the “Envelop” top by On a Lark. You can buy this pretty camisk today in a multitude of colors (and I do mean a lot of colors) for just 25L each. It comes in all your standard mesh sizes, as well as Freya, Isis, Venus, Maitreya, Belleza, Physique, and Hourglass, and each of the fits comes in two different textures for each color — a plain and a damask. Beware if you wear it alone! It covers the front but not the hiney (*winks*). I’m showing you a picture at the bottom of this post so you can see the pretty bow in the back that is the icing on the cake so to speak. Pixel Box offered a weekend gift of a necklace Dreamcatcher that I added to my pretty look. This is a FREE TO ALL gift that you can pick up at the store. Sunday was supposed to be the last day that the gift was out, but when I checked this morning, it was still there… so I recommend haste if you like it and don’t want to miss out! Necklace – Pixel Box – Gift Steampunk Dreamcatcher Steampunk Long (FREE to all Gift/0L/No Group Required) – HURRY, this offer could end at any time! Categories: accessories, dress, fantasy, fetish, fitted mesh, Free, group gifts, groups, jewelry, mesh, shirt, Uncategorized | Tags: 0L, 25L, 25L Tuesday, Catwa, Catwa Annie, Catwa Head, dress, Exile, fab free, fabfree, fabulously free in SL, fantasy, fashion, Fashism, free, free fashion sl, free in sl, free sl, freebie, freebies, freebies sl, gift, gifts, gor, gorean, group gift, Ikon, Lorien, Lumae, maitreya, medieval, Medieval Fantasy, on a lark, pixel box, Roleplay, RP, Second Life, sl, SLink | Permalink.